At Woofers, we believe strongly in supplements to help keep your dog as happy and healthy as possible. Every month we will be featuring a new supplement and talk about what they are used for and why. If your dog is on a kibble-based diet, chances are he is not getting enough omega 3 fatty acids. Salmon oil is the perfect supplement for these dogs, dogs for skin problems, and also Nordic breeds such as the Alaskan Malamute, which do better with higher omega-3s than other breeds. Omega-3s are often neglected because the AAFCO doesn’t consider them essential, but recent research is showing more and more the important of getting enough of this important supplement. 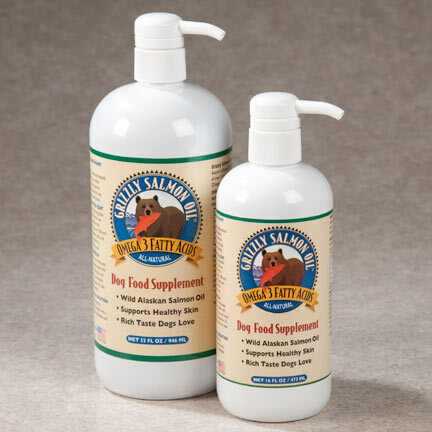 You can buy Salmon Oil here at Woofers Grooming & Goodies for $9.99 for a 4 fl oz bottle, $16.99 for 8 fl oz, and $24.99 for 16 fl oz. Larger sizes are available.